An amazing discovery! Pokemon BREAK Evolution opens a new path to power that builds on a Pokemon's existing strengths and creates all-new battling options! Pokemon Break Through Trading card game Booster Pack!Parallel Words: Two Pathsto Power!An amazing discovery! 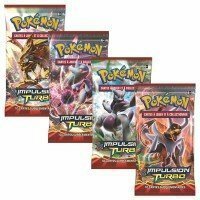 Pokemon BREAK Evolution opens a new pack topower that builds on a Pokemons existing strengths and creates all-newbattling options! These new Pokemon BREAK come from twin worlds, home toZoroark BREAK, Mega Mewtwo X, and Mega Mewtwo Y. One world of technology, oneworld of nature, and all the wonfers of BREAK evolution are yours to explorein the Pokemon card game XY BREAKthrough expansion!